The Huawei Ascend P2 has been unveiled as the worlds fastest 4G smartphone at MWC 2013 in Barcelona, replacing the Ascend P1 in the Chinese firm's line up. It's the first smartphone to pack in LTE CAT 4, which Hauwei claims will allow the Ascend P2 to deliver some blistering web browsing speeds, faster than the CAT 3 toting Samsung Galaxy S3 LTE and iPhone 5. 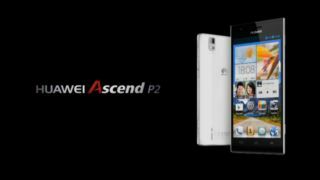 There's also high-speed Wi-Fi for when you want to surf the web at home, with the Ascend P2 offering speeds of up to 520Kbps. The Ascend P2 also packs in a 4.7-inch display with a 315ppi resolution, 1.5GHz quad-core processor, 1GB of RAM, 16GB of internal storage, 13MP camera, NFC technology and 2,420mAh battery into a plastic case which is 8.4mm at its thickest point. Huawei CEO Richard Yu said it could have made the Ascend P2 even thinner, but it would have had to sacrifice the quality of the camera to make this possible. If you've taken a fancy to the Huawei Ascend P2 you'll be pleased to learn that the handset will launch globally in the second quater of this year and will retail for €399 (around £345/$525/AU$510).